After the Tolkien calendar for The Lord of the Rings (2007) and The Children of Hurin (2008), the 2009 Calendar will focus on The Silmarillion and will feature illustrations from the revised illustration edition by Ted Nasmith. There are no 'new' paintings, although none of the pictures have been in a calendar before and really benefit from being seen at the larger size. In this article I will tell a bit more about the artist Ted Nasmith and release a small interview I did with the artist where we talked about the Tolkien Calendar 2009. Ted Nasmith, a native of Goderich in Ontario, spent his youth, just as many other Canadians, by moving a lot. He lived for example three years in France and during holidays visited many European countries. He started drawing a lot during his childhood and already during his education took a road towards making his hobby into a profession by enrolling into a commercial art program. 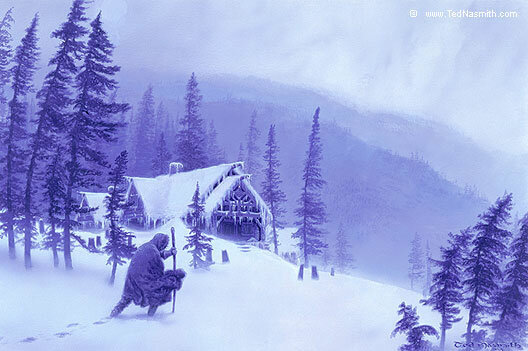 At first working as an architectural renderer, Ted Nasmith soon choose to become a professional illustrator and is now seen as one of the best Tolkien illustrators on this planet. When he received The Lord of the Rings from his sister at age fifteen he was immediately inspired to create illustrations. Soon he embarked on a trip that has left many Tolkien fans stunned. Ted Nasmith's interpretations of scene after scene of Tolkien's tales have lifted the art of Tolkien illustration to another level. George Allen & Unwin soon discovered his art and published it in the Tolkien Calendars (1987, 1988, 1990,1992, 1996, 2000 and 2004) and his paintings where used to illustrate many Tolkien editions. 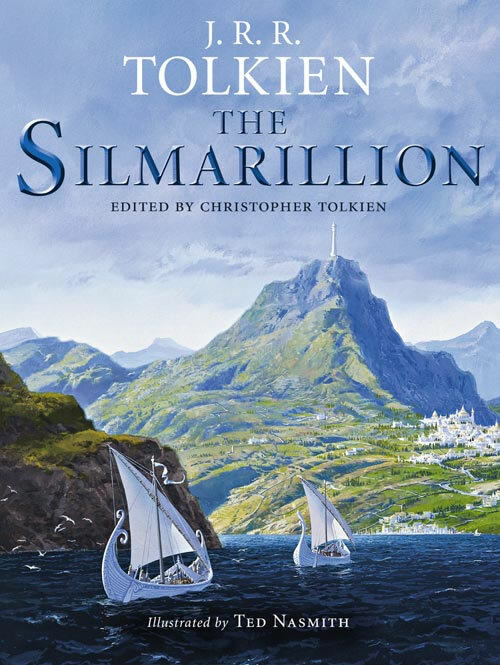 The most renowned is the illustrated edition of The Silmarillion , which in 2004 saw a complete revision and 25 extra illustrations by Ted Nasmith where added in, bringing the total on forty-five colour illustrations by Ted Nasmith. Most of the art from the Tolkien Calendar 2009 can be expected to be taken from these 25 illustrations. 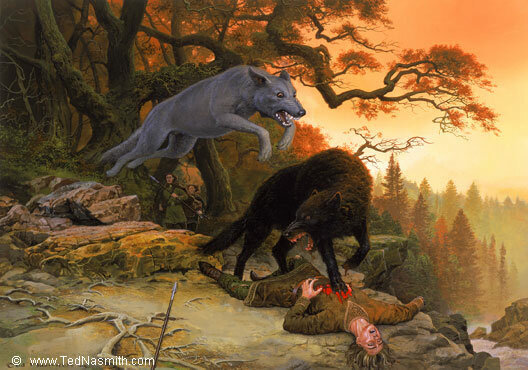 See his art at www.tednasmith.com. Q. Next year the Tolkien Calendar will be featuring your artwork. A lot of Tolkien fans will be very excited with this news. How did this come to be? T: There's not much to tell. I stay in touch with HarperCollins UK, and asked recently whether they might wish to use my art in any upcoming Tolkien calendars. I get requests fairly frequently from fans, and my last outing was 2004. Q. What can we expect to be inside the Tolkien Calendar 2009, any new art? T: No, unfortunately, although normally I prefer that fans see as many new works as possible. 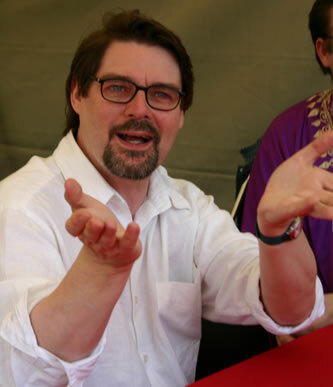 In this case, The illustrated Silmarillion is being promoted anew in 2009, and the calendar and diary will contain published illustrations taken from the book. Q. Will you be doing any new sketches for the Tolkien Diary? Or do you have something special planned? T: The Diary usually contains the same artwork as the Calendar, and that's the case here again. I have offered to provide preliminary sketches as secondary art for both publications, and am waiting to hear if they will be wanted. Q. Normally the calendar always is linked to a new edition; will Harper Collins release a new edition of The Silmarillion or is it merely a re-promotion of The Silmarillion? No, it will be a new printing of the same illustrated edition as was published in 2004. Q. Will you now get the opportunity to get some of your new Tolkien illustrations published? I would love to have the newer LotR and Hobbit illustrations published, but there is no publication planned which could showcase them as yet--except for a fundraiser calendar being discussed currently for The Northeast Tolkien Society of New York City. If it goes ahead it will contain a small number of newer works. We're considering making it a limited edition. Q. For the people who have not seen any of your original art, when will you hold another exhibition?